This was the sweetest thing ever… it was worth posting for first time in almost two years. 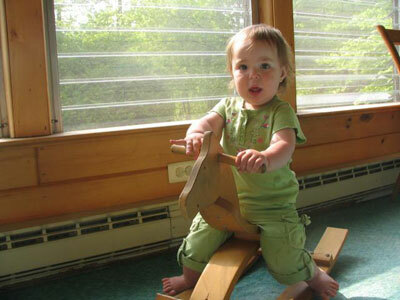 Josie is goofing around on a rocking chair and laughing hysterically. My heart just melted. Josie will turn two on Saturday. Admit it. You visit this site to see pictures and video of cute children. Not to read my rambling comments. It’s okay. I totally understand. Well, tonight you are in luck. I’ve created a gallery showcasing Josie’s first few days at home. Highlights include her first bath and meeting Aunt Meg. Go see. UPDATE (6/30/2009): More pictures added… including a pony party! And, perhaps more exciting, I’ve put several new videos on YouTube. Watch them on my channel page. You’ll witness a live baby burping demonstration performed by a three year old. UPDATE (6/30/2009): More video added, too! Tara and Josie came home from the hospital yesterday. Ellie and I both agree that it’s SOOO good to have them home. We’re just enjoying being together and getting to know Josie. So far Josie is very even tempered. She rarely cries for more than a minute or two and she has been sleeping very well. She’ll conk out for hours at a time during the day if we let her. But we’re worried that sleeping all day means being awake all night. So we’ve been trying to wake her up and keep her engaged. The coolest thing however is how Josie (even at this early stage) really watches whatever Ellie does. And Ellie, for her part, has been a wonderful big sister. She is eager to help out with bottle feedings, diaper changes, and all the other little baby tasks. (Her favorite is burping the baby… and she’s good at it!) Obviously this is a big adjustment for Ellie, and there have been a few moments when she’s acted out. But overall she seems very happy about the changes to her world. We are trying to stay very attentive to her needs and feelings. Oh hey, another thing. I added a few more pictures to the gallery in the post below this one. New ones start here. They are as cute and precious as you might expect. There are a number of adorable videos that I will get online in the near future, as well. I’m operating on about 3 hours sleep in the past day and a half. But I didn’t want that to stop me from sharing a few pictures. Highlights include meeting Big Sis and Grandma and Grandpa. There’s only about 20 pictures as I write this. But I will probably just add more rather than create too many extraneous slideshows. I’ll post an addendum when there’s something new to see. 7lbs 10oz. 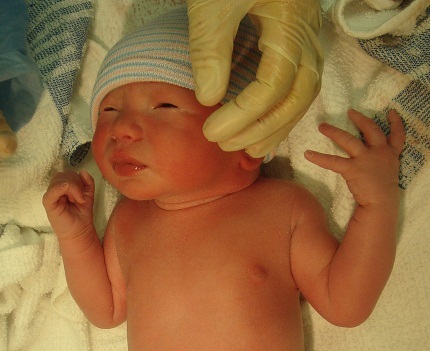 Born at 2:30 am, June 18th 2009 via c-section. Mom, baby (and dad and sister) are all doing fine! So it’s looking like tomorrow will be the big day. We’re going to the hospital at 6:30am to have labor induced. Hopefully it will go quicker than last time which was 16 hours. Keep your fingers crossed. In my continuing effort to get all our media more accessible, I have put many of Ellie’s little video clips in one location on our Google Pics page. It’s not the best solution, but it puts everything in one place. If you have the bandwidth, be sure to click the “View HQ Video” link. Go watch! We’re going to have another baby! Another girl! And she is due any day now. No promises, but there’s a decent chance I’ll have the requisite motivation to begin updating again. I have to admit that this blog was a fantastic way to keep our family and well-wishers up to date about Ellie’s early days. We just came back from a long weekend at our family’s house in the Catskills. It was beautiful and relaxing. We had a great time running amok in the outdoors. It was so much fun to see Ellie explore an environment that’s completely different from the cityscape she’s used to. I am the first to admit that I’ve done a woefully inadequate job of updating the blog. 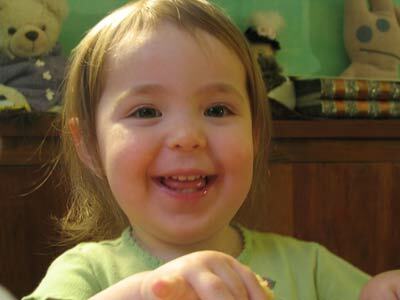 There’s no denying it now that it’s 2008 and only a few short weeks before Ellie’s second birthday. But here goes. It’s been wonderful watching her transform from a baby into a toddler… and we are now bordering on “little kid” territory. She is active, playful, and imaginative. She is also quite silly and enjoys laughing heartily with very slight provocation. Her vocabulary has absolutely exploded over the past few weeks. It’s gotten to the point that I’m not even surprised anymore when she correctly uses a new word. She mostly uses English, but she’ll throw in a few words in Spanish for spice. She consistently speaks in two or three word sentences, too. It is a very strange feeling to have a rudimentary conversation for the first with someone you’ve known for two years. Here are your long overdue links to gallery pictures: May through August and Septmeber through January. We hope you enjoy. My next project – if I can find the time somewhere between chasing after Ellie all day and collapsing at night – is to create a sequel to last year’s critically acclaimed Ellie’s First Year video. Hopefully I can have it ready in time for her birthday! Ellie is now a confirmed toddler. By that, I mean she toddles everywhere spawning mayhem and wreaking havoc. She leaves a trail of destruction wherever she goes. She also expresses herself much more easily now. She has an arsenal of words (or approximations of words) that convey her emotional state, her wants and needs. Many of her words are clearly understandable as either English or Spanish. Some are only understandable to her parents. Some are only understandable to Ellie, herself. Some examples are “Didoh” and “Bahdoo”. Personally, I find these words the most entertaining. At 16 months old, Ellie is taller and heavier than many two year olds she knows. She still loves to read books, watch Sesame Street, and climb up and down stairs. She visits the playground almost every day, and enjoys swinging, riding in cars, and playing ball. She’s also fascinated by water in all its forms. She likes drinking it, bathing in it, splashing in puddles, and watching fish. Maybe she’ll be a sailor one day. We’re looking forward to swimming this summer! 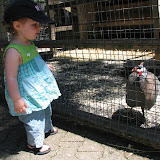 Next, I created a new mini gallery devoted to Ellie’s various zoo trips. So far, she has only been twice, but I hope to add more after each visit. Think of this gallery as an exotic safari through animal pictures, baby pictures, and unbridled cuteness. Finally some housekeeping notes about this blog itself. First, In case you hadn’t noticed, those of you that signed up for e-mail notifications about blog updates have not been receiving them. These notices just never worked properly and I finally disabled them. But I have an alternate solution. Keep an eye on your e-mail for more info. Second, a fair number of spam comments have been slipping through my filters and appearing in random posts. Some of them are rather disgusting. I’ve been deleting them as soon as I find them, but some may slip through. I apologize for the inconvenience.